2019 riding goals build upon what I had set for myself in 2018. I love setting goals and as I had mentioned on an Instagram post, I set small achievable goals for Lexington and I in our training rides. Lexington means the world to me and I would never set him up for something I don’t think he can reach. Setting us both up for success makes each ride educational and fun. We always work off of what I’ve learned with my coach, so we productive! My main goal for Summer 2019 is to start showing. Truth be told, I have only attended schooling shows and clinics, so this is a big one for me. I’m not necessarily interested in winning, but it would be nice to place. Lexington has had a successful career in Show Jumping, so I’ve been deciding if I want to start showing in a ring he is comfortable in or just start fresh and take him Eventing! This winter I’m planning on him being in a regular program which will help both of us get ready for show season. As I stated before Lexington will be in a regular program which will in turn keep me on one as well! I like to think I’m pretty good at getting myself up to the barn but I’m not always being productive and proactive with my riding. So, that being said, my next goal is to be more consistent in both my quality of riding and training schedule. In my opinion, this goal is one of the hardest because it’s all about holding yourself accountable. I plan on utilizing Google Calendar to keep me on track. Lexington doesn’t demand constant work, but he always likes a job! I’ve never been a super nervous rider, but that being said, I could always use some more confidence. My biggest downfall is not believing in myself and always taking the blame if it’s not necessarily my fault. For example, if Lexington does something naughty during a ride or even on the ground, my first response is “that was my fault, sorry”. This year I need to find my riding confidence because I feel like if I don’t find it soon, my goal of showing will be unattainable. In our lessons we have been working on a lot of bending, transitions, and listening to my seat. He is really great with the bending and transitions now, not like he wasn’t before but he was a bit stiff with me. My goal for him is to be more attentive to my seat not just hands, so that when I sit up he also sits back and quietly comes back to me. This will help when we start jumping bigger courses. We do a lot of lengthening and shortening, as well as various sized circles. These exercises will be done throughout 2019 as well, with the addition of canter pole work! Lexington also likes to rush his lead changes if I forget to to set him up (oops…). I kid you not, he feels like a rocket launching which is definitely unnecessary so we are focussing on a more balanced lead change! Right now I am working on figure eights with poles, but my goal for early 2019 is to master calm and balanced lead changes in a serpentine (eventually with jumps!). As I mentioned before, I really really want to get Lexington off property more frequently next year, but Lexington can be a bit of tricky loader. Ultimately, we just have to practice loading him on and off the trailer. I’m not the most confident with loading him so it is a learning experience for the both of us! Lexington’s goal goes hand in hand with some of mine. If we are being honest, my list is sooooooo long. There are so many things I need to work on so bare with me. My equation needs some attention, especially my releases over fences. With that being said, I think over all I get stiff throughout my elbows and lack movement. In terms of releases over larger jumps, I plan on using a neck strap until my muscle memory starts to kick in. I need to learn how to ride more with my seat so that Lex can learn to adjust accordingly! I’ve really taken a liking to flatwork which is super exciting! When I was younger, all I ever wanted to do was jump, jump, jump! But this past year, I’ve come to greatly appreciate the fundamentals of flatwork, so I’d really love to do some dressage. Dressage is the one ring that really intimidates me which is why I’m a little timid to step into Eventing, but stepping out of my comfort zone will be so good for me! 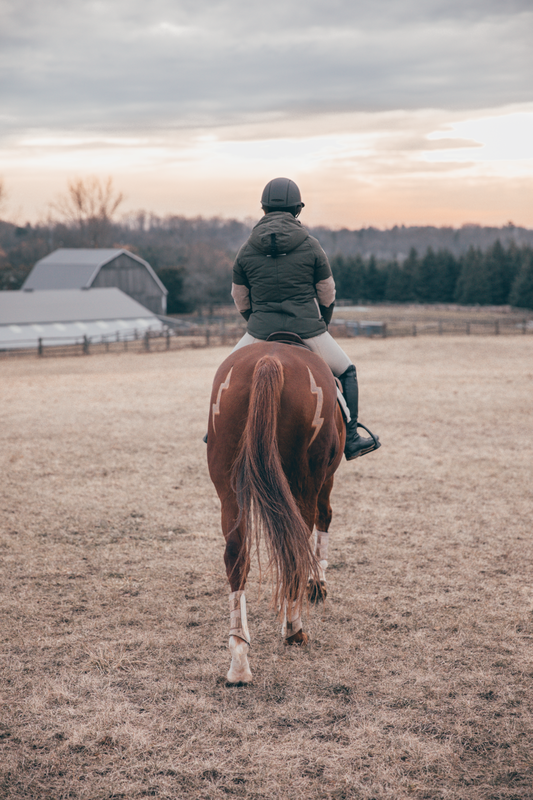 I believe mastering the basics of dressage and flatwork will boost my confidence for when I start jumping bigger courses with tricky combinations. Nonetheless, I am very excited to see what 2019 has in store!